2016 was a great year for video games, and an even better year for video game music. It was also a diverse year, with a mix of Norse folk music, spy movie histrionics, ambient soundscapes and extremely heavy metal. This piece originally appeared December 21, 2016. As with past years (see: 2012, 2013, 2014, 2015) I’ve polled our staff to come up with a list of our favorite video game soundtracks from the year. They’re below, in alphabetical order. Most of these albums are available on various streaming services and popular stores like iTunes and Amazon, though when possible, I’ve included links to Bandcamp/direct store pages. Crank up the volume and listen along. I have a soft spot for Civilization intro cinematics. They’ve got their particular aesthetic down to a science—the glory of man and progress, the slow move toward a better world—and they always make me smile. Geoff Knorr’s fine, ever-evolving score will keep you company as you play Civilization VI, and Christopher Tin’s “Sogno di Volare (The Dream of Flight)” makes for a perfect introduction to the main menu. I got unexpectedly emotional the first time I fired up this game, and may or may not have just left the menu music running through my headphones for an hour while I did other things. It wouldn’t be a Final Fantasy game if it didn’t have a fantastic soundtrack, and Yoko Shimomura’s work on Final Fantasy XV continues the tradition. Not only did Shimomura come up with some terrific battle music, she and the rest of the music team skillfully implemented a huge amount of layered, interactive background music. Walk into a shop and the score will grow subtly more complex; walk back outside and it’ll seamlessly thin back out. The music expands and contracts in harmony with your surroundings, almost like it’s breathing. No, the new Hitman score was not composed by beloved series composer Jesper Kyd. However, Niels Bye Nielsen’s grandiose, spy-movie-influenced score wound up redefining what I thought a Hitman game should sound like. The music is fine on its own, striking an enjoyable balance between Henry Mancini and Harold Faltermeyer. But it really comes to life as it’s implemented in the game. The score swells and tapers off to accompany your undercover exploits, imbuing every action with just the right degree of drama. Few video game moments this year were more satisfying than casually strolling toward a Hitman exit point as the “mission complete” music swells, secure in the knowledge that you are the baddest baldheaded mother out there. I Am Setsuna is a back-to-basics JRPG that combines several familiar elements into a finished product more fresh than it first seems. Much of the game’s distinct identity comes from Tomoki Miyoshi’s musical score, a collection of piano compositions that expertly channel legendary composer Joe Hisaishi to establish the game’s mournful, elegiac tone. If a video game soundtrack is only going to feature a single primary instrument, piano is probably a pretty good one to go with. Inside is the rare game where the musical score is inextricable from the overall soundscape. (The Portal games are similar in this regard.) It makes sense that the game’s composer and sound designer are the same person: a maniac named Martin Stig Andersen, who passed some of the game’s audio through a human skull in order to get the tones he wanted. It’s difficult to demonstrate just how effective Inside’s music is to people who haven’t played it, but the “Soundwave” sequence in the video above captures one of my favorite musical moments. Andersen’s music tends to creep up on you, like the hum of a fluorescent light that gradually reveals hidden harmonic layers. If you didn’t play this game while wearing headphones, you missed out. Takeshi Furukawa’s score for The Last Guardian wasn’t quite what I was expecting. More than anything else it channels mid-90s Thomas Newman, evoking a luminous sense of lost majesty and, at the fringes, danger. The full soundtrack contains more good pieces than I could hope to share here, but the very first one does a good job of setting the tone. When the strings come in at 0:45, you can almost see the rolling fields outside Shawshank State Penitentiary. I was fully charmed by this straightforward and earnest visual novel, which I played a little while back on my colleague Gita Jackson’s recommendation. Much of my charmed-ness was due to the disarming musical score, which I shouldn’t have been surprised to find was composed by Undertale maestro Toby Fox. Rose of Winter’s music provides a perfect platform for following along with the stories of Rosemary, Crow, and the rest. 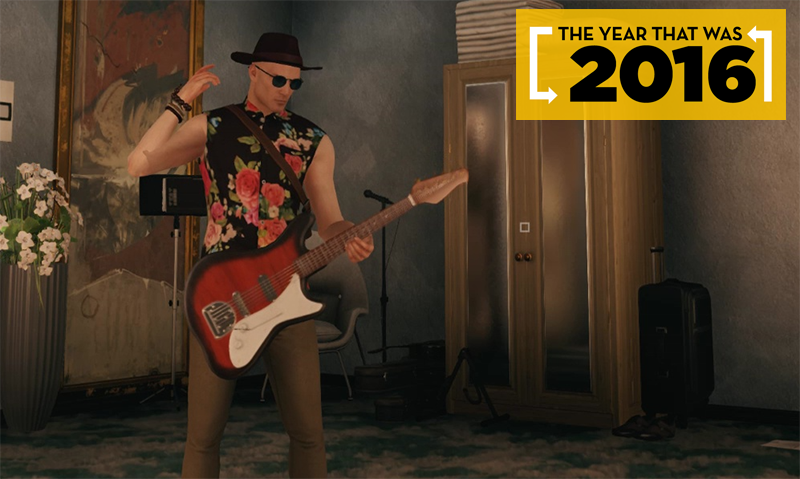 And there you have ‘em: our picks for the best video game soundtracks of 2016. Share your own picks in the comments below.